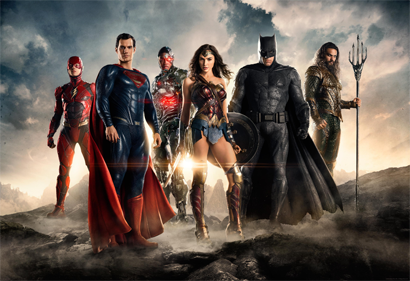 At the SDCC today, Warner Bros. released this, the first official photo of the Justice League cast in costume! Click to embiggen, and also check out the first full trailer to Wonder Woman, also released today! Remember the tagline, "Unite the Seven"? So who is the seventh? Green Lantern? Mera? Vulko? We'll find out in November 2017! Oh, boy do I hope the seventh member is Vulko. But his armor though! And his eyes are blue! Looks Fantastic! I'm willing to bet unite the seven was just something being thrown around before the decision was made to keep Green Lantern out of the first movie. Or maybe not. Prove me wrong, kids! Prove me wrong. The most astounding thing...Superman is SMILING!!! Or at least half-smiling. Whodathunkit?